Is there anything more classicly American that a navy-striped top with red pants? I couldn’t help but feel drawn to this combination in light of the upcoming holiday. Thankfully we are still having enough cooler days here in NY that I can get away with wearing my wide-leg trousers for a little bit longer…so I’m taking advantage of it while I can. seeing these pants on you is making me wish i would have bought the whbm ones i had my eye on months ago. is this location close to your house? it's beautiful! I love those wide leg pants. Super pretty. And in such a bold color! Gorgeous! It is amazing how you managed to make something simple so stylish! That Zara clutch is divine.. I've been trying to look for one here (Dubai) but they are sold out.. seen other substitute but still the one from Zara is what I want 😉 hope it will pop out from somewhere for me..
you are so lucky to have a nice weather…. it's way too hot in Croatia already! love this classic look! This is such a classic combination, I love it! Also LOVE the addition of that gorgeous gold clutch, so pretty! Of course I love the classic pairing of colors, but I love the way you wear it! 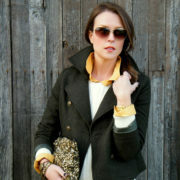 The wide leg pants are fantastic, and the gold clutch is so fun! I have that top in orange/white, and I wish I would have bought the blue/white! This is great! I love navy and white, but I usually avoid wearing them with red for fear that I will look overly nautical or dressed for a theme party. I think these particular pieces together work great…You could wear them on July 4 to be festive, but wearing them on another day still looks chic (and not as if you're just confused about what day it is). Lovely! Loving this outfit! It has me thinking about what I should wear for the 4th! Loving these pants. Never tried the Kardashian Kollection yet. Does it run true to size? So All-American chic! Those pants look great on you! beautiful backdrop. Great pants, not many women could pull these off but you do effortlessly. Perfect fit. I have been finding myself in a lot of red and blue lately. Guess we are excited for the upcoming holiday? I love your style .. & you are so pretty! Such a lovely outfit!!! Great for the upcoming holiday because of the color combination! And you look gorgeous!!! If you have a chance, please check out my blog. I always love the navy and any shade of red (pink, peach, etc) combo… They are the perfect complimentary colors. You look fabulous! Can't believe those are "Kollection"! I'm in love. Gorgeous! I love the red, white & navy. And the gold sparkle is so fun. I love using my Kate Spade sparkler clutch that looks really similar! Love these pants on you! I have a bright pair of red pants that have been sitting in my closet for months now. They are a size too big and I haven't fixed them yet. This makes me want to break out the sewing machine and fix them! wow – I love how fabulous this outfit is with a foundation on classic, lady-like pieces! Those red pants are beyond gorgeous on you! I LOVE your outfit!!! And that clutch is cute, I love just love the whole look. Really cute. Love this from head to toe! 10!!! Such a cute look! Loving those trousers and your necklace! Wow, Fabulous, amazing outfit. perfect combination. One of my favorite looks to date. Love everything about this look and the fact that the photos were taken by the water, even better! Gorgeous Kimberly! 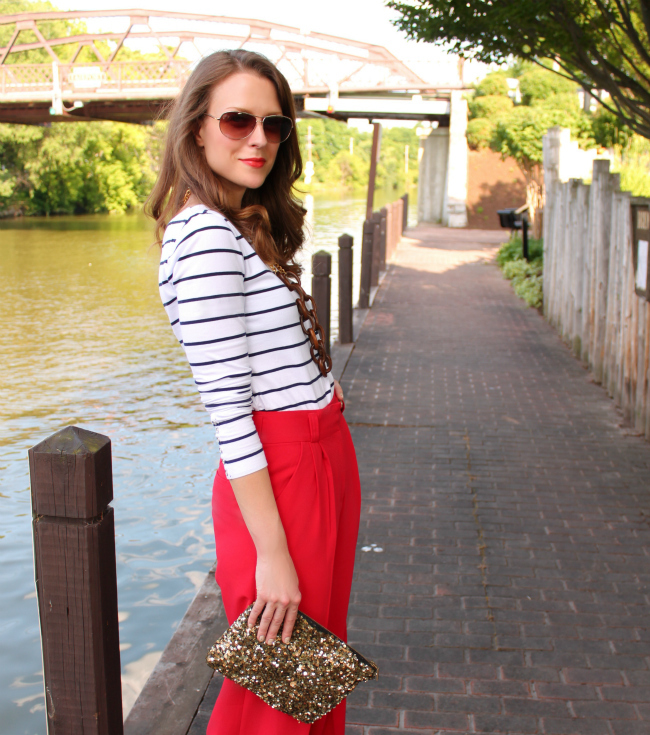 red flared pants and a striped top is perfect. You look stunning and those pants are amazing! Those pants are amazing on you. 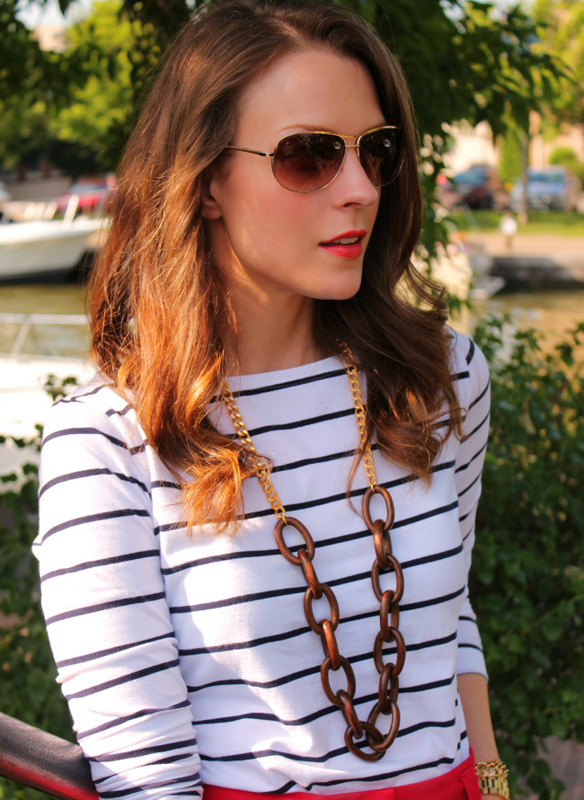 Perfect backdrop for a perfect nautical look. You look gorgeous! Those pants were made for you…they look like Alice + Olivia pants! Adorable outfit. I have the same top in most of the colors…they are the perfect stripe tee. I had a similar outfit with the bright orange Loft pants they had in the spring line. Love this outfit! 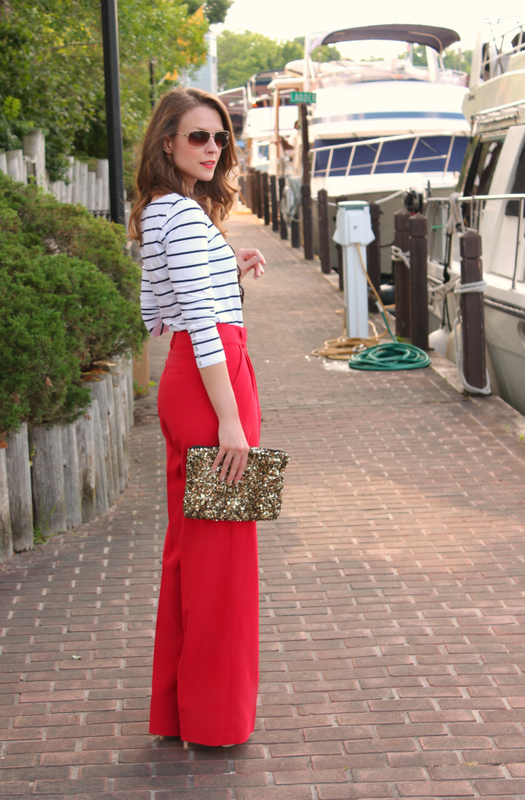 Those bright red wide-leg pants are so fun! Love this outfit – it's so chic! Those trousers look so fab on you!!! I love this look! Red white blue – same colours as the union jack but you couldn't be more American with this outfit. Wear those trousers for as long as the weather permits – they are a great shape on you! This outfit is so clean and chic, I want to copy this one lol. Love the contrast of the glittery bold clutch with this too. Is this in NY? if so where???!!?!?! ?